Choosing the most appropriate insulation material on the external walls of a building deserves serious attention. The present work is concerned with the economic and environmental assessment of using different insulation materials on the external walls of buildings located in four different degree-day regions. For this purpose, optimum insulation thicknesses were investigated for fibreglass, expanded polystyrene, glass wool and phenolic foam. Consequently, energy savings over a period of 10-years, payback periods, fuel consumptions and CO2 and SO2 emissions are determined for natural gas, coal and LPG. The annual heating and cooling energy required were estimated by using heating and cooling-degree days methodology. It is deduced that the cities of Antalya and Şanlıurfa positioned in the first and second degree-day regions in Turkey, respectively, were not able to save energy for fibreglass as an insulation material with natural gas as fuel. The result demonstrated that the amount of energy savings fluctuates from 1.91 to 368.58 TL/m2 in the event of employing different fuel types for heating, change between 2.74 and 399 TL/m2 in case heating and cooling requirements are provided together at externally insulated walls of buildings. Payback period ranges from 0.081 to 3.28 years for heating and cooling together. Reductions in emissions fluctuate between 45.65-86.81 % for coal, 31.03-83.21 % for natural gas and 69.64-92.49 % for LPG. A. Aytac& U.T. Aksoy, Enerji Tasarrufu iç ve Dış Duvarlarda Optimum Yalıtım Kalınlığı ve Isıtma Maliyeti ilişkisi, J. Gazi Univ. Fac. Eng. Archit., vol. 21, pp. 753–758, 2006. T. Keskin, "Enerji Verimliliği Kanunu ve Uygulama Süreci", Mühendis ve Makina vol. 569, pp. 106-112, 2007. N. Evcil, "Isı İzolasyonu ve Dış Duvarların Enerji Etkin Yenilenmesi", Yüksek Lisans Tezi, İstanbul Teknik Üniversitesi Fen Bilimleri Enstitüsü, İstanbul, 2000. A.Ulaş, "Binalarda TS 825 Hesap Yöntemine Göre Isı Kaybı, Yakıt Tüketimi, Karbondioksit Emisyonu Hesabı ve Maliyet Analizi", Gazi Üniversitesi Fen Bilimleri Enstitüsü, Yüksek Lisans Tezi, Ankara, 2010. A. Dombaycı, M. Gölcü &Y. Pancar, "Optimization of insulation thickness forexternal walls using different energy-sources", Applied Energy, vol. 83, pp. 921–928, 2006. A. Bolattürk, "Optimum insulation thickness for building walls with respect to cooling and heating degree-hours in the warmest region of Turkey", Building and Environment, vol. 43, pp. 1055-1064, 2008. N. Daouas, A study on optimum insulation thickness in walls and energy savings in Tunisian buildings based on analytical calculation of cooling and heating transmission loads, Applied Energy, vol. 88, pp. 156-164, 2011. K. Çomaklı & B. Yüksel, "Optimum insulation thickness of external walls forenergy saving", Applied Thermal Engineering, vol. 23, pp. 473–479, 2003. A. Hasan,"Optimizing insulation thickness for buildings using life cycle cost", Applied Energy, vol. 63, pp. 115-24, 1999. M. S.Mohsen, & B. A.Akash, "Some prospects of energy savings in buildings", Energy Conversion and Management, vol. 42, pp. 1307-1315, 2001. M. J. Al-Khawaja,"Determination and selecting the optimum thickness of insulation for buildings in hot countries by accounting for solar radiation", Applied Thermal Engineering, vol. 24, pp. 2601-2610, 2004. O. Kaynaklı,"A study on residential heating energy requirement and optimum insulation thickness",Renewable Energy, vol. 33, pp. 1164-1172, 2008. A. Uçar & F. Balo, "Determination of the energy savings and the optimum insulation thickness in the four different insulated exterior walls", Renewable Energy, vol. 35, pp. 88-94, 2010. D. B. Özkan & C. Onan, "Optimization of insulation thickness for different glazing areas in buildings for various climatic regions in Turkey", Applied Energy, vol. 88, pp. 1331-1342, 2011. 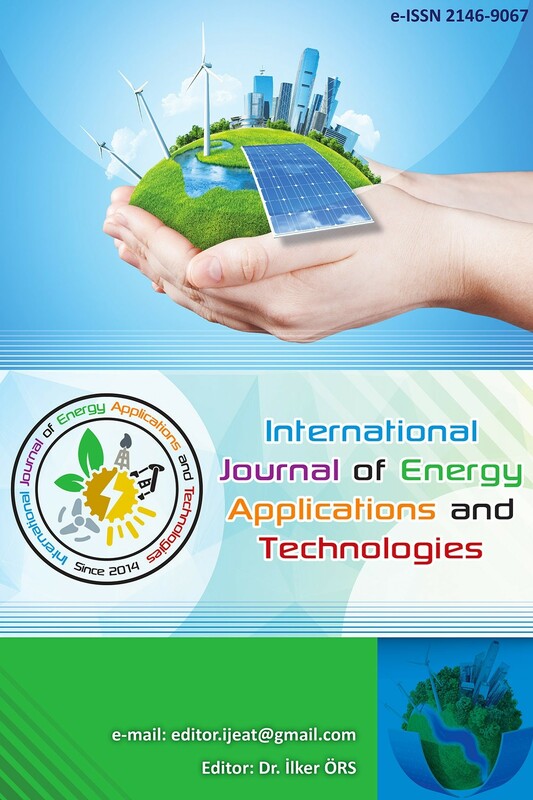 C. Aktemur,"A Case Study for Estimation of Heating Energy Requirement and Fuel Consumption in a Prototype Building Using Degree-Day Method in Kocaeli", International Journal of Engineering Technologies, vol. 3, pp. 27-36, 2017. A. E. Gürel & A. Daşdemir, "Türkiye’nin dört farklı iklim bölgesinde ısıtma ve soğutma yükleri için optimum yalıtım kalınlıklarının belirlenmesi", Erciyes Üniversitesi Fen Bilimleri Enstitüsü Dergisi, vol. 27, pp. 346-352, 2016. N. A. Kurekci, "Determination of optimum insulation thickness for building walls by using heating and cooling degree-day values of all Turkey’s provincial centers", Energy and Buildings, vol. 118, pp. 197-213, 2016. M. Ozel, "Cost analysis for optimum thicknesses and environmental impacts of different insulation materials", Energy and Buildings, 49, 552-559, 2012. N. Daouas, Z. Hassen& H. B.Aissia, "Analytical period solution for the study of thermal performance and optimum insulation thickness of building walls in Tunisia", Appl Thermal Eng, vol. 30, pp. 319–326, 2010. M. Tolun, "Farklı derece-gün bölgeleri için yalıtım probleminin incelenmesi", PhD Thesis. Enerji Enstitüsü, 2017. A. Aytaç & U. T. Aksoy, "Enerji Tasarrufu İçin Dış Duvarlarda Optimum Yalıtım Kalınlığı ve Isıtma Maliyeti İlişkisi", Gazi Üniversitesi Mühendislik Mimarlık Fakültesi Dergisi, vol. 21, pp. 753-758, 2006. O. Kaynakli, "A review of the economical and optimum thermal insulationthickness for building applications", Renew. Sustainable Energy Rev, vol. 16, pp. 415–425, 2012.